Did you and your boat have a little too much fun over the summer? That boat damage that occurred out on the local water is not going to be repaired on its own. While you’re stuck indoors because of the frigid Minnesota temperatures, take advantage of this time and seek professional boat repair services, so that you and your boat will be ready to get back out on the water this spring! By teaming up with Anchor Marine Repair, the #1 boat repair shop in the Minneapolis and St Paul area, your boat will be repaired to better than pre-accident condition in no time. We can’t speak for other boat repair shops in the area, but at Anchor Marine Repair, we happily work to make the boat insurance claim and repair process as simple as possible for you. Our repair specialists work with nearly all insurance providers and we make sure that your best interests are always our first priority. Let us work with your insurance provider directly so that you do not have to deal with the behind the scenes paperwork. Next thing you know, your boat will be repaired to pristine condition, and your insurance will handle most of the bill. Lack of Experience – If you are new to maneuvering the waters on your boat, there is a lot to learn. The number one cause of boat accidents across the country is due to inexperience. Weather – If you keep your boat docked all boat season, or you get caught in the middle of an unexpected storm, your boat may get damaged because of mother nature. Hail, high winds, any many other conditions can be detrimental to your boat. Faulty Equipment – Sometimes you have no control over the damage that occurs with your boat. There will be times during the life of your boat where certain equipment malfunctions or breaks. With over 45 years of combined experience, our dedicated team can pinpoint the mechanical issues and get them repaired quickly. Debris – Throughout lakes across Minnesota, there commonly is debris within the waters that you must keep an eye on. Sometimes the debris comes out of nowhere, and you simply don’t have enough time to react. When repairing your boat, we do everything in our power to ensure that your experience is positive. 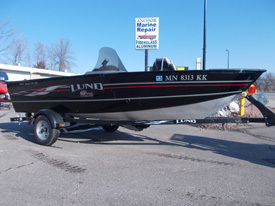 Offering complimentary pickup and delivery services within 250 miles of the Mpls/St Paul area, you have no excuse as to why your boat hasn’t been repaired. Additionally, your boat will be stored within our 10,000 square feet of workspace. All of our estimates are free of charge giving you the peace of mind that you are not locked into a decision. Take advantage of the winter season and send your boat over to Anchor Marine Repair today so that you and your boat can get back to having fun together this spring! Give us a call at (763) 972-3540 to learn more about our boat damage repair services and how we have become the #1 repair shop in the Minneapolis and St Paul, MN area.